WASHINGTON Memories of the sights and sounds of America's pastime and the feats of the greatest stars in Major League Baseball history will be relived starting June 27 when the U.S. Postal Service issues new postage stamps commemorating 11 classic ballparks. Issued in association with Major League Baseball, the Baseball's Legendary Playing Fields stamps feature Chicago's original Comiskey Park, Cincinnati's Crosley Field, Brooklyn's Ebbets Field, Boston's Fenway Park, Pittsburgh's Forbes Field, New York's Polo Grounds, Philadelphia's Shibe Park, Detroit's Tiger Stadium, Chicago's Wrigley Field and New York's Yankee Stadium. 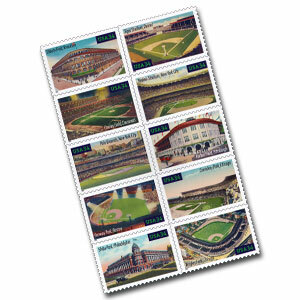 St. Louis' Sportsman's Park is depicted on the header of the 20-stamp sheet, which includes two 34-cent, self-adhesive stamps of each of the other 10 ballparks. Many of these legendary ballparks are gone, but they will not be forgotten, said John Nolan, Deputy Postmaster General and Chief Marketing Officer. That is the beauty of the commemorative stamp program. Stamps are America's calling cards. They honor our heritage and share history as the Postal Service establishes relationships through the processing and delivery of the daily mail. Only four of the 11 legendary playing fields depicted on the stamp sheet still stand: Tiger Stadium, Fenway Park, Wrigley Field and Yankee Stadium, with the latter three still used by their respective teams. These four classic ballparks will be the sites of official first day of issue ceremonies for the Baseball's Legendary Playing Fields stamps. At Fenway, Wrigley and Yankee Stadium, the ceremonies will take place prior to baseball games scheduled for June 27. The Tiger Stadium event will be held that day at a time to be determined. The Baseball's Legendary Playing Fields stamps will be available at the ceremonies and only at Boston, Chicago, Detroit and New York post offices on June 27. The stamps will be available at post offices across the country starting the following day. Designed by Phil Jordan of Falls Church, Va., the stamp images are based on vintage postcards from the collection of Ron Menchine, a former Washington Senators announcer who recently wrote the book, A Picture Postcard History of Baseball. To see the Baseball's Legendary Playing Fields stamps, and images of other forthcoming 2001 stamps and stationery, visit the Postal Store at www.usps.com and select Stamp Release Schedule. For previous releases, select Index of Stamp Issues. All current stamps and other philatelic products, as well as a free comprehensive catalog, are available by calling toll free 1 800 STAMP-24. In addition, a selection of current stamps and gift items are available online at the Postal Store. A set of 10 Baseball's Legendary Playing Fields stamped postal cards, a set of 10 first day covers, a full pane first day cover, an uncut press sheet and a collection containing several of these items are also available. The sets of 10 first day covers will feature New York, N.Y., first day cancellations on the Yankee Stadium, Polo Grounds, Ebbets Field, Shibe Park and Forbes Field stamps; Chicago, Ill., cancellations on the Wrigley Field and Comiskey Park stamps; Detroit, Mich., cancellations on the Tiger Stadium and Crosley Field stamps; and a Boston, Mass., cancellation on the Fenway Park stamp. The full pane cover will be postmarked with cancellations for all four first day of issue cities. A symmetrical park that favored pitchers over hitters, this South Side Chicago landmark featured graceful arched windows. In 1933 it hosted the first All-Star Game. A fan of gimmicks, the owner installed the first exploding scoreboard in 1960. Major League Baseball night games debuted at this Cincinnati park in 1935, with FDR switching on the lights from the White House. One of the game's smallest, most intimate stadiums, players had to run uphill to the outfield fence. Home to the game's most colorful fans, this Brooklyn park had quirks galore, including an angled right field wall and a sign that when hit won the batter a new suit. The Major League Baseball TV debut occurred at Ebbets Field in 1939. Boston's intimate Fenway Park has the Green Monster, a 37-foot-high left field wall. Red Sox fielders who mastered its unpredictable caroms became legends. The home run that ended game six of the 1975 World Series made history there. With expansive foul territory and deep outfield dimensions, this park was a pitcher's friend. Ironically, in the 61 years that the Pittsburgh Pirates called Forbes Field home, no one ever pitched a no-hitter there. This storied ballparkonetime home to the Giants, the Yankees, and, briefly, the Metswas the site of the entire 1921 and 1922 World Series. The horseshoe-shaped field hosted one of the most famous home runs: the 1951 Shot Heard 'Round the World. The first Major League Baseball concrete-and-steel stadium, Philadelphia's Shibe Park featured a 34-foot-high right field wall, as well as a facade with stately columns and a French Renaissance cupola. This St. Louis landmark had joint occupantsthe Browns and the Cardinalsfor 33 years. It hosted the high jinks of the Cardinals' Gas House Gang. The Browns' flamboyant owner once put a 65-pound, 3-foot-7-inch player up to bat. Opened in 1912 as Navin Field, Tiger Stadium was home to the Detroit Tigers for 88 seasons. It put fans very close to the field and featured a right field upper deck that jutted out ten feet farther than the lower deck. Ivy-covered outfield walls, a hand-operated scoreboard, and more day than night games are just a few of the reasons fans everywhere love Chicago's Wrigley Field. When the wind blows out, scores can enter double digits; when it blows in, Wrigley is a pitcher's delight. Yankee Stadium has hosted more World Series games than any other ballpark. Deep to the power alleys but short down the lines, beyond its left-center field fence lie monuments and plaques honoring Yankee greats.